Jess gets crafty: It's in the bag! Around Christmas time the wonderful Sew Mama Sew blog hosted another huge giveaway with tons of crafty blogs taking part. Lots of very generous blog authors take the time to host giveaways on their blogs and there were some really fantastic prizes up for grabs. Even though I'm not a very lucky person I managed to win something - the lovely Green Bag Lady did a very generous giveaway of one finished bag as well as the materials to make another bag. She had 100 winners so I can imagine she must have been at her sewing machine for hours making up bags for this giveaway. The bag on the left is the one that the Green Bag Lady made up for me and I just love the colours. This is the bag that I'm going to be giving away as my Mother in Law was quick to reserve it the minute it came through the door. So with my first New Year's resolution in mind (conquer the sewing machine) I set to work on the material that I was sent. 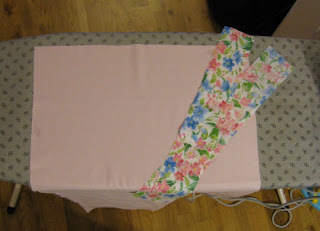 First off I had to figure out how to turn the iron on and set up the board (yes, you've guessed it, I don't do any of the ironing in this house) and then with my fabric pressed and cut ready I dusted off the sewing machine and had a go. 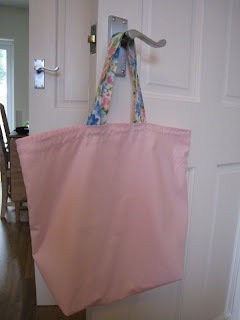 Surprisingly I encountered no real problems at all and with the help from the online video and instructions I whizzed through making this little bag as though I was some sort of pro. 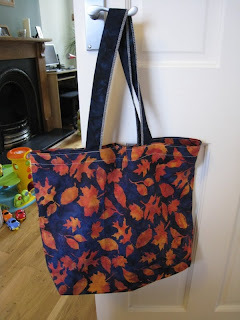 My sewing machine and I are now firm friends and I am seriously thinking about making up a batch of these bags for next year's Christmas presents (that's resolution #2 start Christmas preparation now and hopefully prevent the usual Christmas last minute panic). Love your bag. My new years resolution was also to learn to sew.